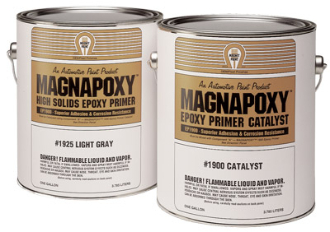 MAGNAPOXY™ is a two-component, 3.5 VOC, lead, chromate and isocyanate free epoxy primer formulated for maximum adhesion and corrosion resistance to properly prepared metal, fiberglass and aluminum surfaces. Ideal for truck fleet refinishing, OEMs, heavy equipment and automotive refinishing where extended service life is important in harsh and abusive environments. Convenient 1:1 mix ratio with no induction time. Fills minor scratches and surface imperfections. MAGNAPOXY™ is compatible with all topcoats and is highly recommended for use under MONSTALINER™ Bedliner, MAGNACRYL™ Acrylic Enamel 9000 Series and MAGNATRON™ Acrylic Polyurethane 5000 Series. Can also be reduced for use as a sealer. Mixed, usable pot life is 24 hours. Not for use in combination with lacquers or acrylic lacquer base products.